An effective inspector is a slow thinking inspector. A fast thinking inspector is a cat chasing a red dot. The problem is expert bias. An OSI has 40 experts at work. That’s a lot of bias to avoid. An effective inspector is a slow thinking inspector. A fast thinking inspector is a cat chasing a red dot. The trouble with experts is that they are wrong more often than they think they are, and by a greater margin than they would ever expect to be, for reasons that are predictable. Cognitive bias is a fascinating area of psychology. I recommend Kahneman’s book “Thinking fast and slow”. It should be required reading for all inspectors. ‘Fast thinking’ is easier, and is used in preference when we make decisions about things we feel comfortable with. For experts, this includes technical decisions. Slow thinking is harder, more effortful, and requires careful calculation, assessment and analysis. It is actually physically more difficult to do. Your eyes dilate and your heart rate increases when you consider a difficult problem that requires slow thinking. To encourage inspectors to think slowly in situations where they would normally rely on their expertise to use the much easier fast thinking is difficult because it is very counter intuitive. So why go to the trouble? Availability bias – in forming hypothesis inspectors might rely on what easily comes to mind as an explanation. Anchoring bias – having formed an opinion of what might be going on, it is very hard for the fast thinking mind to move away from the anchor of that initial perception. What you see is all there is – the mind is very good at making causative links, and a fast thinking mind will use what it can see (the information available) and not consider ‘unknown unknowns’ that it can’t see. An Inspected State Party with an inspection area of 1000 km2 to play with could easily toy with the biased mind of an unwary inspection team to divert their attention to areas away from the true trigger event. 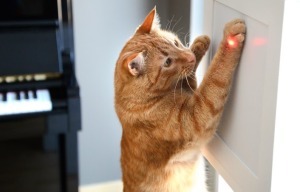 The team would be like the cats chasing the red dot! The ITF provides a framework to encourage the team to think slowly (which we have been doing brilliantly in IFE14 ). The best defence against bias and fast thinking is to be aware how and why it happens. An effective inspector is a slow thinking inspector. A fast thinking inspector is a cat chasing a red dot.